Very rarely does a recipe get a thumbs-up from all five of us, all at once. Our tastes are just too varied. But this recipe was a five-thumbs-up winner! t I’ve been loving the new Jimmy Dean Turkey Sausage Crumbles that I tried out back in January. They have been great additions to our recipes. Most recently, I tried them out in a good friend’s recipe, which turned out to be a huge hit! t At our house, we love pizza. We make homemade pizza all the time. We also love eggs and omelets. My daughter and I actually went to the White House for the first-ever Kids’ State Dinner in 2012, after our recipe for an egg white omelet with broccoli and cheese was selected as a winning healthy recipe. It is because of that trip that I had the opportunity to become friends with Paula, another mom who was on the trip with her son. t Because Paula knows how much we love omelets, she recommended that we try an omelet that her dad used to make when she was little. It’s a pizza omelet, or basically an omelet-turned-pizza, and what better topping to add to our usual pizza toppings for Paula’s Pizza Omelet than Jimmy Dean Turkey Sausage Crumbles! t Let me tell you, we loved it! Very rarely does a recipe get a thumbs-up from all five of us, all at once. Our tastes are just too varied. But this recipe was a five-thumbs-up winner, and it just goes to show that Jimmy Dean Fully Cooked Turkey Sausage Crumbles make any recipe in your arsenal of recipes taste even better! t To create Paula’s Pizza Omelet for lunch one rainy Saturday, I first gathered all of my pizza toppings. I decided that in addition to the fully cooked Jimmy Dean Turkey Sausage Crumbles, which I literally just had to pour into a bowl, I would slice up some tomatoes and make half of our pizza with sausage only and half with sausage and tomatoes (since not everyone loves tomatoes). I also added shredded mozzarella cheese and pizza sauce, which are both staple ingredients in most of our pizzas. Having the turkey sausage crumbles already cooked was a huge bonus for me and a big time-saver as well. t My turkey sausage and tomato pizza omelet was now ready to go! I scrambled up my eggs, cooked them into an omelet and created Paula’s Pizza Omelet for our lunch. Believe me when I say that it’s the first of many turkey sausage and tomato pizza omelets we’ll be making at our house! t If you love pizza and you love omelets, I encourage you to try a pizza omelet! 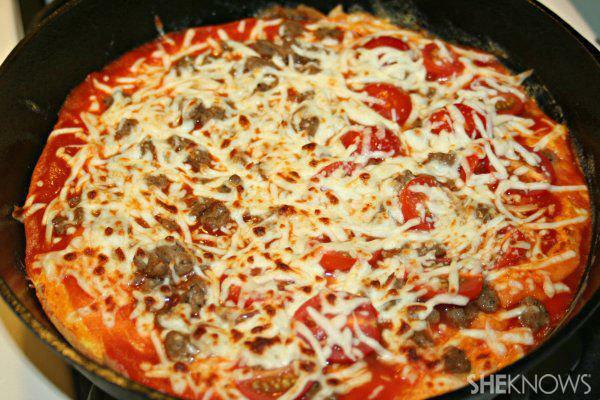 I know that you will love the tasty and easy-to-use Jimmy Dean Fully Cooked Sausage Crumbles on your pizzas. There are many varieties to choose from, so you can always find one to add to any of your usual recipes. t Here are the ingredients and directions for my turkey sausage and tomato pizza omelet. Enjoy! In a separate bowl, scramble 8 eggs. Spray a well-seasoned cast-iron skillet (or any frying pan) with nonstick cooking spray. Cook your eggs in the skillet on top of the stove until they’re cooked almost all the way through. To finish the eggs off, I put the entire skillet under the broiler for a couple of minutes until they were done. Spread your pizza sauce on top, just as you would with a regular pizza, and add your desired toppings such as tomatoes and Jimmy Dean Fully Cooked Sausage Crumbles. Place your entire skillet, containing your pizza omelet and all its toppings, under the broiler until the cheese is melted and beginning to turn crispy and brown. Cut the pizza omelet into triangles and enjoy! This is a sponsored post. Although I was compensated for this post, all thoughts contained herein are my own.